Mor Shilon is a trained sociologist (M.A.) and an urban planner (PhD) specialized in urban theories, sociology of space, and technologies. In her research she draws on innovative relational approaches (ANT, NRT) to study present-day urban planning. Particularly, she studies the associations between technology and people mainly in large urban settings and complex infrastructures. In 2017 Mor was a visiting scholar at the Department of Geography, Royal Holloway University of London, working with Prof. Peter Adey. 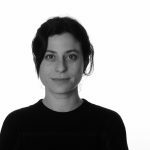 Currently, Mor is a Postdoctoral Fellow at the Faculty of Architecture and Town Planning, The Technion, working under the supervision of Dr. Efrat Eizenberg and Prof. Yehuda Kalay. Among her publications are articles in scholarly journals such as, City - Analysis of Urban Trends, Culture, Theory, Policy, Action; Subjectivity; and Environment and Planning B.